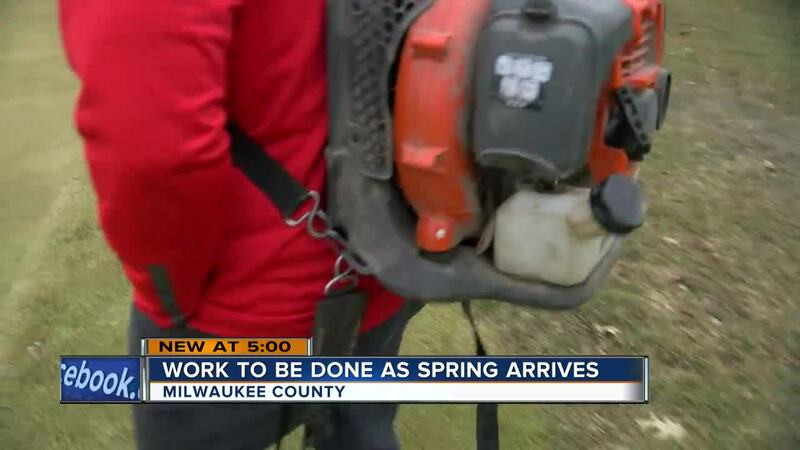 Spring has finally sprung, but for some that means work. From bottles of juice to old gloves, you can find all types of trash in melting snow piles. Joe Wilson is the CEO of Keep Greater Milwaukee Beautiful (KGMB). It’s this time every year that the streets get messy and KGMB helps organize clean ups to take care of the trash. “Snow dictates what we do for about four or five months for us and that snow becomes the glue of all litter,” Wilson said. Inside the pile of snow is everything you lost over the winter. When that snow melts, months of litter and lost items show up on the side of road. It’s not just neighborhoods and rivers that need clean up after the snow. Golf courses need clean up as well. John Canavan manages the turf at Oakwood Park Golf Course. No snow means many are ready to get out their golf clubs. For Canavan, that means it’s time to get to work. “Once we have mid 40s or 50s it’s just people want to be outside,” Canavan said. But before anyone can get on the course, the 320 acres will have to be tidied up picking up sticks, replacing cup and any trash that may have blown on the course. “It’s a slow process but we just get after it. We have cabin fever just like anyone else’s so we’re ready to get outside,” Canavan said.